AIRLINX Communications, Inc. is an international supplier of: DSSS and FHSS spread spectrum radios, PDH microwave radios, SDH/SONET/Fast Ethernet/Gigabit Ethernet microwave/mmwave radios, broadband wireless local loop (WLL) radios, 802.11a/b/g WLAN devices / wireless Ethernet bridges, SCADA/telemetry RF modems, FSO/FSP IR laser freespace optical / freespace photonic communication systems. AIRLINX radios cover HF/VHF/UHF/SMR/ISM/U-NII to 60 GHz frequencies. 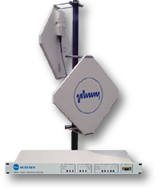 Freespace optical wireless (FSO/FSP IR laser communications) lasercom systems operate in the Terahertz range of the near IR spectrum. AIRLINX also provides RF accessories such as: low-noise/power amplifiers, frequency up/down converters, point-to-point microwave and point-to-multipoint broadband wireless local loop antennas, microwave waveguide components, AC/DC power supplies, DC to RF coaxial lightning arrestors / surge protectors, custom coaxial cable assemblies and RF connectors.